Download the Free EGuide on How to Lead Customer Service Innovation. Today’s buyers demand exceptional customer service, across channels and across time zones. In fact, according to a McKinsey customer experience survey of 27,000 U.S. consumers, companies that provide a superior and low effort customer experience realized a 10-15% increase in revenue and a 20% increase in customer satisfaction. So, how do you create a superior and yet low effort customer experience? Focus on delivering an innovative experience. 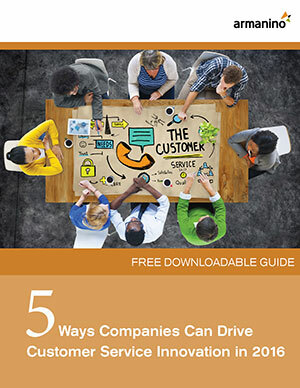 Download our Free Guide on the 5 Ways Companies Can Drive Customer Service Innovation in 2016. Download our 2016 Customer Service Guide on Leading Service Innovation.